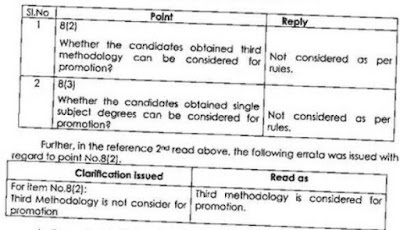 SA Languages Promotion Qualification Clarifications 3rd Methodology and one sitting Degrees or not Eligible for SA's LP promotion as per AP DSE issued R.C. No 2007/Estt.iv/Dt. 28.05.16 Orders. AP School Education Dept DSE AP RC 2007 Clarification on Promotions Qualifications for SA Languages in Andhra Pradesh issued Single subject qualifications/3rd Methodology in B.Ed for Promotions to the Post of SA School Assistant Languages Clarifications issued in AP. In the reference 3rd read above. Government have tumished a capv at representation at RUPPAP and requested the Commissioner at School Education to furnish remarks in the matter. In the reference 4th read above. the RUPPAP represented not to constder the 61 candidates. who studied Singte Subject in languages OR the 3rd Methodotogy in BEd. tor promotion to the post at School Assistant (Languages). In the reterence 3rd read above. the Government Memo along with the representations at RUPPAP and others assactations have been turnished to the Secretary. AP State Counset for Higher Education. Hyderabad with a request to tarnish their views on the matter. In the reterence 6" read above. the Secretary. AP State Counset tat Htgher Education has turntshed the tattowtng remarks/views regarding stngte subtect qualification or 3rd methodotogy in B.Ed.. tor promotion to the post at School Assistant (languages). (i) regulations 1985 regarding the minimum standards at instructions for the First Degree through Formal/Non-Format/Distance Education prescribed that No student shd be eligible for the award at the tirst degree unless he has successfully completed a three year course: this degree may be called the l.A./I.c./I.Com (General Honours/Special) degree as the case may be. (ii) Accordng to the UGC (Minimum Standards at instructions for the Grant at the First Degree through formal Education) Regulations. 2003. 8.1 No student shalt be eligible for the award at the first degree unless he/she has successtuly competed a programme. at not less than three years duration and secured the minimum number at credits prescribed by the university tor the award at the degree. 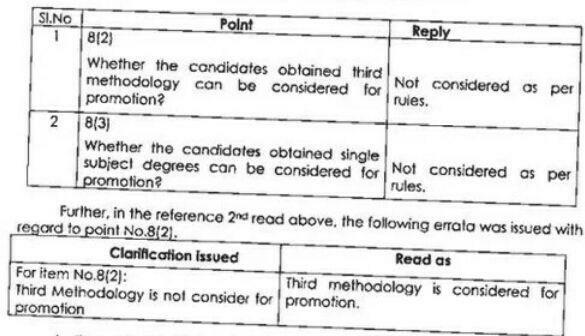 8.2 the degree to be awarded may be called the bachator's degree in the respective dsctpline accordance with nomenclature specified by the UGC under Section 22(3) at the UGC Act. (iii) the UGC has prescribed Regulations with a view to improve the standards in format and non-tormal education. fundamental right of education is not just the right to enter into any institution. appear in any examination and obtained a certificate degree. it means truly educating onesel to acquire knowledge or skill and not just getting a certificate/degree. (iv) the UGC Regulations shalt appty to every university established or incorporated by or under a Centrd Act, Provincid Act or a State Act. and al institutions recognized under clause (0 at Section 2 at the University Grants Commission Act, 1956 and every institution deemed to be University under section 3 at the said Act. (v) the award at a certihcote in a single subject in one sitting through distance mode at the Bachelor's level. in addition to the degree in other (general) subjects tram other University. is not in accordance with the UGC Regulations 1985 and 2003. (vi) the prescription of quatlttcation tor promotion to the post at School Assistants (Languages) clearly speclied that “A " Bachelors Degree in the languages concerned as a main subject or one at the optional subjects and B.Ed.. degree with language concerned or Pandit training etc..' hence. the language Pandits who studied the languages as the main subject or one at the optional subjects are alone competent to teach languages and not the persons who studied only as a single subject in one sitting through the distance education made either in languages or 3rd methodology in B.Ed."